Evidence of LAWS #19 4 A.M.
What a great eighteenth LAWS! The theme was “4 A.M.” and we had a great crowd! 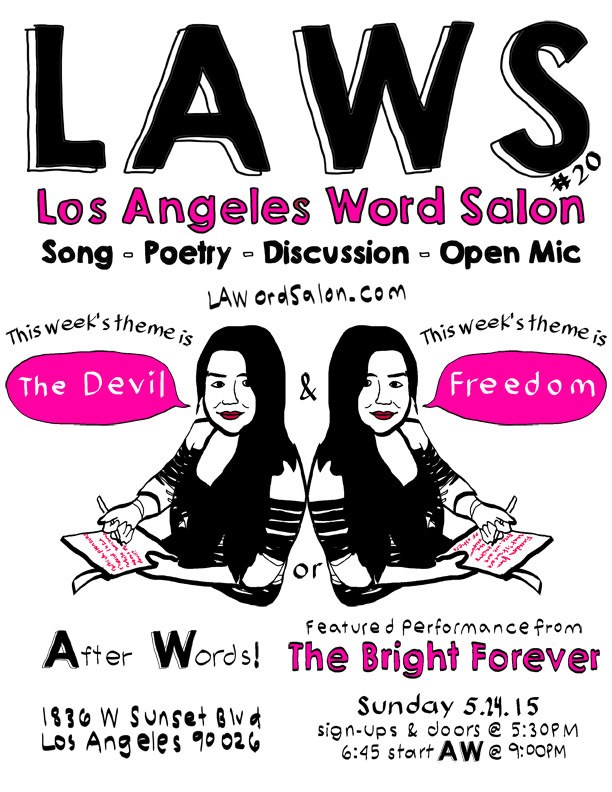 Next week, the theme is, “The Devil” and/or “Freedom”. Here is my poem, entitled: “Rafa’s Lounge” Rafa’s Lounge is underground, though, one flight up from the street below Rafa’s Lounge is where I can be found Sunday nights, everyone is around Sunday nights, the airwaves sound The sounds of poems; stories; music; and more You never know, what’s in store It’ll be real, that’s for sure Maybe punk rock or Walton’s story, Maybe a guy from France, who lost his pants You’ll just have to take a chance. Rafa’s smiling all the while, watching over the scene. The place is downstairs, right off the street Wood; chairs; dim light; art on the walls Three rooms where people gather to share their art with all. Songs; stories; poems; thoughts, A human-connection feeling is present in these rooms. Smoke something, drink some beer, You know the good vibe is here Maybe Sage’s sage wisdom Maybe Jimmy’s story, song, and dance The Active Ingredient has played here before You just never know what’s in store. Rafa’s Lounge is the place to be, The place where you, can feel free Be creative, let it out Rafa’s Lounge is, without a doubt: The expressive person’s place to be The creative person’s place to be The friendly person’s place to be RAFA’S LOUNGE–YEAH!!!!!!!!!!!! ← Ideas (theme suggestions) from Laws #19 4 A.M.